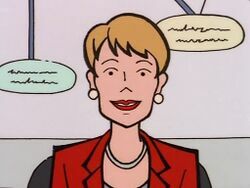 Deena Decker is a time management consultant that Helen Morgendorffer is seeing (so are the Gupty family), and in "Pinch Sitter" she drags Quinn along. She eagerly talks her clients into prioritising what they want in order to manage themselves. She hosted a now lost MTV flipbook]: "Hi! I'm Deena Decker, Lawndale's premiere professional organizing consultant. Did you know that most people waste 50 cubic centimeters of space during the average packing experience? By planning ahead and following a few of my patented "Pack Right! Travel Light!" tips, you can optimize your carry-on capacity: Transfer toiletries into tiny airtight plastic bottles; limit your wardrobe to black, white, and if you must, one accent color; always roll instead of fold; and whatever you do, don't take along any of the unnecessary items like those displayed here. Now excuse me. I have to rearrange my pencils in size order." This page was last edited on 26 April 2018, at 22:01.